Will 260 Million Americans "Disappear" In Less Than 8 Years? 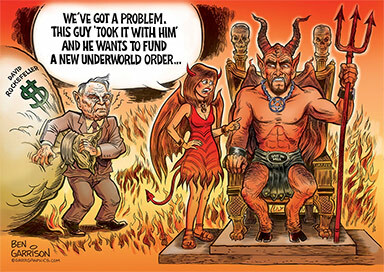 'The purchasing power of the US dollar will continue to plummet like a corrupt banker wearing cement shoes dropping to the bottom of a river as long as the Federal Reserve keeps printing money, backed by nothing, like it's toilet paper'. Last updated on March 23rd of 2017, the 'country' page for the United States of America over at Deagel.com seen in the screenshot above still shows a forecast population for the US for the year 2025 to be 61 million people. Much more than just a 'significant' drop from the 321 million living in America in 2015, we've asked in stories on ANP time and again what they expected to happen to 260 million Americans and where they were going to go in less than 10 years. While the forecast population drop is shattering, maybe even more doom-portending are the forecast financial numbers outlined by Deagel with a gross domestic product drop from $18 trillion in 2015, #1 in the world, to a forecast of only $949 BILLION in 2025, ranked only 11th in the world. The drop in forecast military budget from $781 billion a year in 2015 to only $8.2 billion a year in 2025 shows that according to some, President Donald Trump's increased military budget might be a temporary thing. Meanwhile, with 2025 less than 8 years away, the GDP per capita drop from $55,855 in 2015 to a forecast of only $15,517 in 2025 shows us many more Americans will be living in poverty in less than 8 years from now than are here now. What does Deagel know that we don't know? This new story from Zero Hedge reports the 'retail apocalypse' has officially descended upon America as Dave with the X22Report also expands upon in the 1st video below. And as we read in the new SQAlert republished below videos, everything happening now geopolitically and financially is tied together quite tightly with Deagel's 2025 forecast which still shows a forthcoming collapse for America despite President Trump. While Deagel admits their numbers are only a 'forecast', we should keep in mind the sources for their information are the United States government, the CIA, the US Department of State, the US Department of Defense, the World Bank, the European Union, the US Army, the US Navy, the US Marines, the US Air Force, and the US Coast Guard among others. Many people have asked, what does Deagel.com do? Deagel keeps track of numbers. 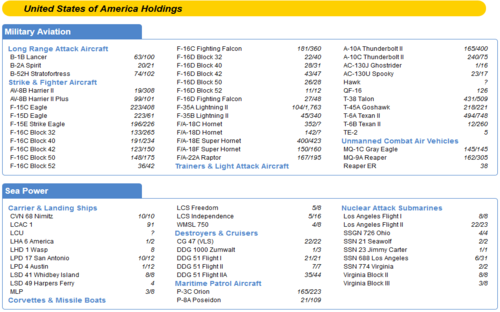 For example, as seen in the screenshot below, if you want to know how many B-1B Lancer Long Range Attack Aircraft the United States of America had in their possession, we'd go to Deagel which has numbers for everything 'military industrial complex' related. And as we also see, they update their website quite regularly as seen in several March and February 2017 entries. 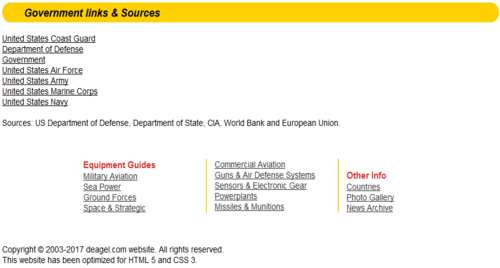 So, with strong ties to the US government and US military as sources, what does Deagel know that we don't know? Besides the other huge drops in population, GDP, and military budget, the Deagel category for Purchasing Power Parity (PPP) tells us exactly what the mainstream media won't: Very difficult times are ahead if Deagel's forecast for 2025 is correct. 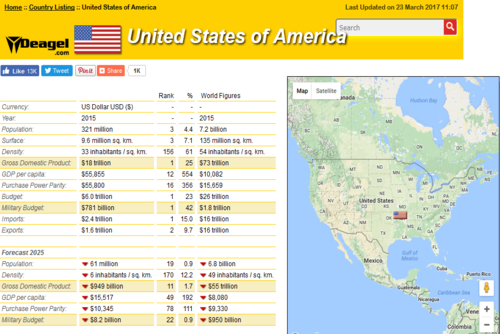 In 2015, the United States stood at #16 in the world for PPP at $55,800. In comparison, the failing socialist nation of Venezuela stood at #89 in PPP at $16,700. For 2025, Venezuela is forecast to be #86 in the world at a PPP of $9,108, a big drop from 2015. The US's forecast PPP for 2025? $10,345 for a ranking of #78 in the world. Quite a steep drop when you consider Venezuela's PPP in 2015 was $6,000+ more than they are forecasting the US's PPP to be in less than 8 years from now! What might happen to cause such a HUGE drop in the US dollar's purchasing power? It's clear to us that Deagel's forecasts show an America in 2025 in total collapse with the purchasing power of the US dollar worse than what is happening in Venezuela right now. 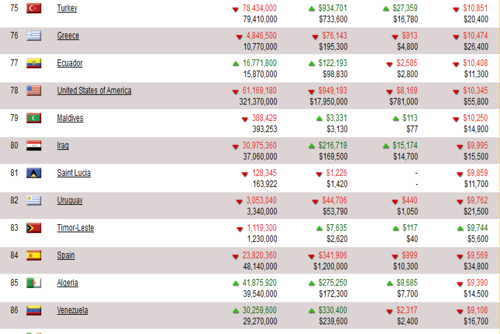 You can see the US in the chart from Deagel below, sitting only 8 spots above Venezuela in Deagel's 2025 PPP forecast. This chart shows the US approaching 3rd world nation status by 2025. Why is such a huge drop in our PPP forecast for 2025 for the US, dropping from $55,800 to $10,345? Of course, the purchasing power of the US dollar will continue to plummet like a corrupt banker wearing cement shoes dropping to the bottom of a river as long as the Federal Reserve keeps printing money like it's toilet paper. For even the people in Venezuela have recently figured out it's much cheaper to use money there as napkins or toilet paper than actually having to go out and buy the products. Similar to what happened during the 1930's and the Weimar Republic which printed so much money it became completely worthless, what we are watching unfolding is the globalists long held plans to destroy our sovereignty and nation state by spending us to the point we are now at, with a national debt clock ticking onwards approaching $20 trillion and a possible hard debt limit ahead of us. 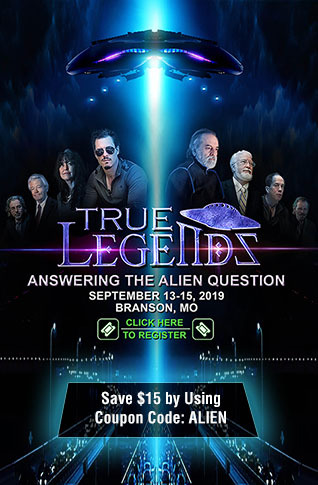 As the SQAlert republished below videos from Dr. Jack warns, bringing down our entire existing system could allow the globalists to bring in their long-sought cashless society and 'mark of the beast' complete control system. Are there any answers and might 'gold' be the way America has to go? The recent stories from across the world and the internet prove to us that the 1% are preparing for 'the apocalypse', with many believe there is no turning back and danger is ahead as Erin Elizabeth over at Health Nut News recently reported. Whether North Korea brings global war or what is happening now in Venezuela comes home to America, there's never been a more important time to prepare for possible 'dark times ahead'. As we hear in the 2nd video below and read in this story from Infowars, Sweden too is preparing its citizens for war, activating cold war bunkers over fears of a Russian invasion. Interestingly, as we had previously pointed out in this story at ANP back on April 9th of 2015, the nation of Sweden and other Western nations also were showing a substantial forecast population drop by 2025. The majority of the economic and demographic data used in the making of the forecasts is widely available by institutions such as the CIA, IMF, UN, USG, etc. You can see the most relevant data at every single country's page. There is a tiny part of data coming from a variety of shadow sources such as Internet gurus, unsigned reports and others. But all these sources are from the internet and are of public domain for at least a minority. The key element to understand the process that the USA will enter in the upcoming decade is migration. In the past, specially in the 20th century, the key factor that allowed the USA to rise to its colossus status was immigration with the benefits of a demographic expansion supporting the credit expansion and the brain drain from the rest of the world benefiting the States. The collapse of the Western financial system will wipe out the standard of living of its population while ending ponzi schemes such as the stock exchange and the pension funds. The population will be hit so badly by a full array of bubbles and ponzi schemes that the migration engine will start to work in reverse accelerating itself due to ripple effects thus leading to the demise of the States. This unseen situation for the States will develop itself in a cascade pattern with unprecedented and devastating effects for the economy. Jobs offshoring will surely end with many American Corporations relocating overseas thus becoming foreign Corporations!!!! We see a significant part of the American population migrating to Latin America and Asia while migration to Europe - suffering a similar illness - won't be relevant. Nevertheless the death toll will be horrible. Take into account that the Soviet Union's population was poorer than the Americans nowadays or even then. The ex-Soviets suffered during the following struggle in the 1990s with a significant death toll and the loss of national pride. Might we say "Twice the pride, double the fall"? Nope. The American standard of living is one of the highest, far more than double of the Soviets while having added a services economy that will be gone along with the financial system. When pensioners see their retirement disappear in front of their eyes and there are no servicing jobs you can imagine what is going to happen next. At least younger people can migrate. Never in human history were so many elders among the population. In past centuries people were lucky to get to their 30s or 40s. The American downfall is set to be far worse than the Soviet Union's one. A confluence of crisis with a devastating result. DR.JACKS RESPONSE TO MY COMMENTS ON PAYLESS CLOSING STORES! Great observation—this will be how they will eventually implement the mark here in the US. Eventually in order to buy (amazon) as this and other online places will have the needed items that one needs as there are already shortages of stuff everywhere for example it is very hard to find storable food (mountain house) at the local Wal-mart or Bass Pro. So you are right as more and more brick and mortar stores go out of business getting what is needed will be harder and harder to find. I needed to get something from Northern Tool and they have a local physical location here in Charlotte however they did not carry it in the store so I had to order it online and I was able to have it delivered to the local store for free to pick-up. I am finding this also to be the case at Wal-mart. They are having “shortages” that no one seems to notice because they will fill the “empty holes” on the shelves with items so that there are no gaping holes. The last thing they want the sheep to do is to start thinking. Once the right circumstances hit whether it is the boogy man of NK or Russia, or simply an economic collapse they will “pull” the plug and then when the “solution” (problem, reaction, solution) is provided after all of the people suffer they will flock to take the mark! When I read the Bible and think about how Esau sold his birthright for food - (imagine how hungry he must have been!) something most people here in the US have never experienced (me included) or how the prodigal son was so hungry that he ate the slop that was given to the pigs, it will not take much for people to kill one another in the streets (literally) for food. Then when the “system” comes back up in order to do business (buy and sell -get food) you will have to take the mark—this is why last year it was leaked out that the big banks are all working on some type of block-chain (crypto currency) technology. This will eventually replace the physical currency. So as you have said in the past this is where the physical gold and silver will come into play for bartering the black market! Remember the new census is to take place in 2020- it will take about a year or so to get completed. Why is this interesting? This is interesting due to the fact that by 2025 according to Deagle.com which you have reviewed before the population of the US is supposed to be about 50 million or so down from the 330 million. So this means that by 2020-there will be some form of census being conducted. This would mean that by 2020 or so the “grid” or some form of it or the stabilization of everything should be back which would mean that something will happen in the next 12 months as those who know have said that it will take about 18-24 months to restore the grid after it is taken down and as Hawk has said many times on his show that 90% of those living within the US will be dead in 12 months. 330 million times 90% leaves 33 million left!